The kitchen is the heart of the home, where family and friends gather to eat, drink, relax and socialise – they’re truly multifunctional spaces. Kitchen lighting can have a huge impact on the whole aesthetic of your kitchen, so it’s an important consideration when you’re designing your kitchen. Effective kitchen lighting will ensure that your kitchen is a cosy, inviting place to be, as well as remaining functional and cater for a range of activities, from the obvious food preparation to entertaining, dining and even working. 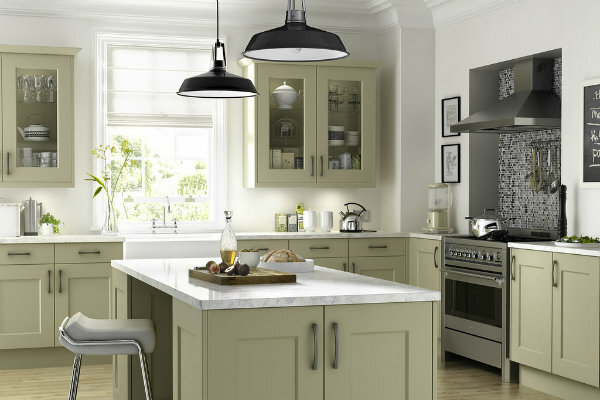 Our top kitchen lighting tips will ensure that your kitchen is a functional, stylish and relaxing place to spend your time. There are so many different kitchen lighting options, so it’s important to consider all of your available choices in order to create a truly stylish, functional lighting design. You don’t have to stick to just downlights or pendants to light the room; there are a variety of lighting options which will add an extra dimension to your kitchen. 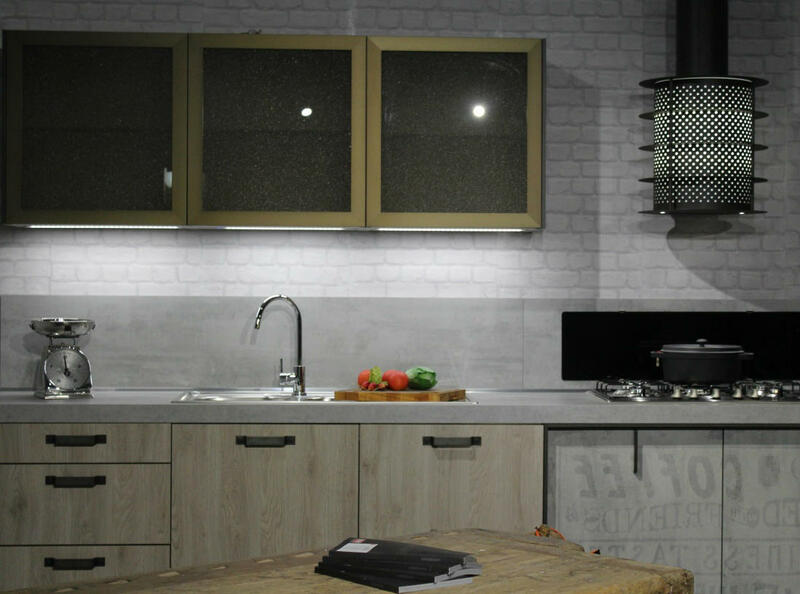 Task lights are the brightest, most functional lights which should target the areas where you’ll be preparing food, including the cooker, sink and worktops. Under-cabinet LED strip lights are a great task lighting option and will easily direct light over the areas you need it the most. Not only do LED lights not generate as much heat as traditional halogen lights, but they’re also more energy efficient, making them a great money-saving option for your kitchen. Accent lighting can add a little bit of drama to your kitchen and bring the whole room together. Accent lights are perfect for drawing attention to specific and decorative features in your kitchen. Pendant lights make great accent lights and are commonly used to light kitchen islands and dining tables. With a huge range of pendant lights available on the market, you can truly tailor your lighting to your individual tastes and style. LED strip lights are excellent forms of accent lighting and are incredibly versatile. By installing strip lights under counters and in inside cabinets, you can draw attention to the little details in your kitchen and really help to add the finishing touches to the room. As the name suggests, ambient lighting provides the general ambiance to the room and is cast over a wide area. Ambient lighting doesn’t tend to be focussed on any particular area and is really only used as a general light source. The most common form of ambient lighting in a kitchen is recessed downlights arranged in rows across the entire ceiling. LED strip lights are another great example of ambient lighting. By placing them on top of kitchen cupboards facing the ceiling, the light will bounce back into the room and create a warm, soft glow and create a truly inviting atmosphere. Natural light is another - often overlooked - source of ambient lighting, so it’s important to consider your light sources when designing your kitchen lighting and make use of natural sources of light. If you’re working with a relatively small space, you can use clever lighting tricks to make the room look larger and more open. Angling some directional spotlights up towards cupboards and walls can dramatically affect the appearance of the room. By pointing the light towards cupboards and walls, the light is reflected back into the room, thus, giving the illusion of a larger space. Ambient ceiling downlights will have a similar effect by giving the appearance of a raised ceiling, thus, visually expanding the space. It’s important not to place these all in one line as this may make the room look narrower. Instead, randomly, but strategically-placed downlights will distribute light throughout room and make it appear larger and more open. LED striplights are another great lighting choice for a small kitchen as they are unobtrusive and don’t take up any extra space. Simply install under your cabinets and along your skirting boards for an easy way to increase the light in the room, while still considering the space available. Thinking outside the box when you’re designing your kitchen lighting can create some truly dramatic results. Placing strip lights under cabinets and islands can make them seem as though they’re floating, truly enhancing the feel of your kitchen and adding some interesting focal points. Don’t just focus your lighting on the outside, either. If you’ve got glass cabinets, adding some lights inside can bring an extra dimension to your kitchen as well as illuminating those all-important wine glasses. 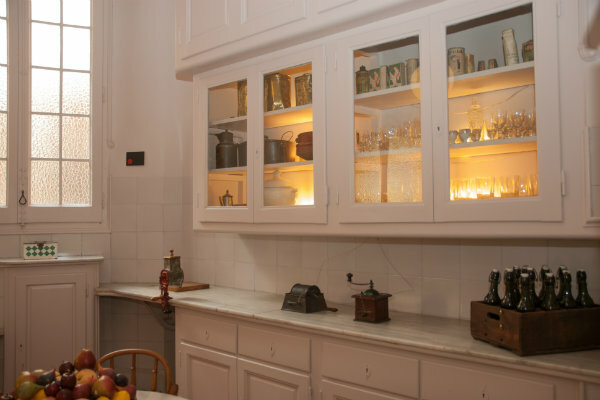 A dimmer switch is the perfect addition to set the mood and add ambience in your kitchen. This simple addition to your kitchen lighting will ensure that the room is a truly multifunctional space. Whether it’s being used for work, cooking, romantic dinners or hosting some guests, having the option to manipulate your kitchen lights will allow you to set the mood according to the occasion. Talking about switches, it’s also important to make sure that each set of lights can be controlled individually so you can tailor your lighting design according to mood. You don’t want your task lights to be on whilst you’re trying to enjoy a candlelit dinner. Equally, you might prefer to have other lights dimmed while you’re preparing your food. There are multiple options available to help you to control your lights individually, so do some research to find out which solution would be best for you. There are so many kitchen lighting options available that it’s easy to go overboard with your lighting design. Try to avoid having too many hanging pendant lights throughout the room. Ideally, pendant lights should be used as focal points to add visual interest to the room as opposed to taking over the room and making it look cluttered. Stick to two or three pendant lights over the dining area or island to keep this as the room’s focal point, rather than allowing them to detract from the rest of the room. By following these tips, you’re sure to create a warm, welcoming kitchen, perfect for hosting guests and adding some extra enjoyment to your cooking.